The Yamaha Arius YDP-181 digital piano features 88 weighted keys with Graded Hammer effects that make playing much like an acoustic piano. Its 128-note polyphony also mimics an actual piano by allowing for multiple notes to be heard without being cut off when sustained. It features three damper pedals with half-damper effects for enhanced control. That is only the short version. There is more! There are three levels of touch sensitivity to accommodate various playing styles and techniques. The YDP-181 uses Advanced Wave Memory stereo sampling to provide a sound that is true to that of an acoustic instrument. With the piano’s preset songs and track recording function players have the ability to learn songs and keep detailed progress recordings. The piano uses a sound mechanism derived from Advanced Wave Memory recording techniques. This sampling method provides a realistic sound similar to the real instrument. The sound is recorded digitally and sent through a high-quality digital filter. Advanced Wave Memory also produces the dynamic nuances created from playing keys at different strengths. The three damper pedals provide a half-pedal effect for enhanced control over the length for which notes are sustained. Without this feature the pedal can only present a present on or off effect. Half-pedal control allows the note to be sustained based on how far the pedals are pressed. The full keyboard features 88 keys with Graded Hammer action. This provides a feel more natural to the acoustic piano with heavier keys in the lower notes and lighter notes at the end. This also helps players build technique before advancing to standard pianos. 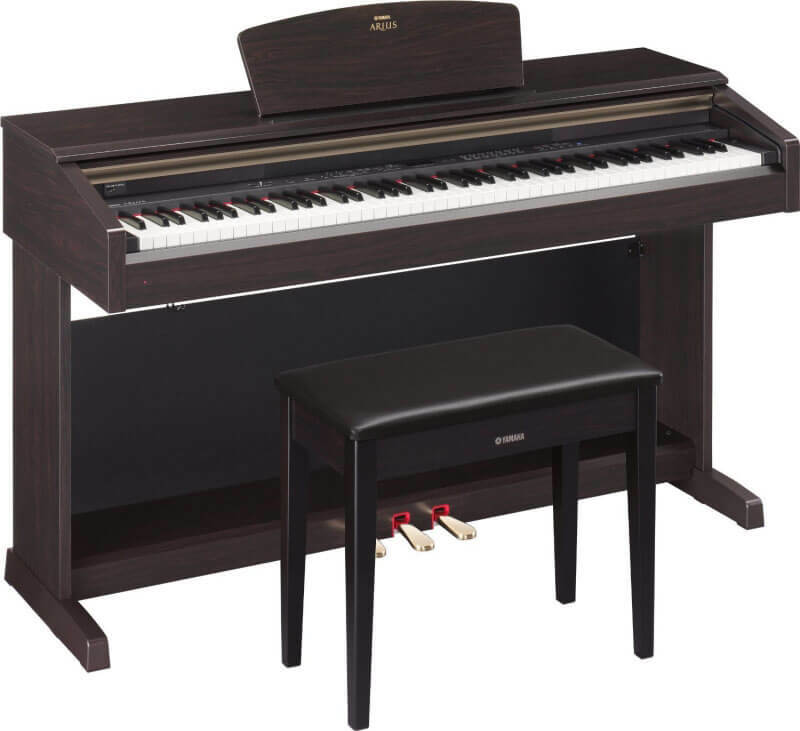 Considering the price tag, the Yamaha Arius YPD-181 is a good weighted digital piano in this price range. The Yamaha YDP-181 offers a variable touch sensitivity to imitate the same effects found on the standard instrument. It can be adjusted to match player preferences or skill level. The sensitivity can be turned off and placed on a fixed setting as well. Like many Yamaha digital pianos the YDP-181 offers a sound that is true to that of the real piano with its Advanced Wave Memory sampling technique. The keyboard features Graded Hammer effects that also make playing feel realistic when compared to an acoustic. The piano features three damper pedals for playing a variety of pieces and half-pedal function for increased control and expression. A polyphony of 128 notes provides the player with the ability to play multiple notes rapidly while preserving each one. There are some drawbacks to the device, however, with the lack of a USB to host line being one of them. Users will have to supplement connecting lines to use the piano with a computer. There have also been reports on the size of the bench and the strength of the damper pedals. Realistic Audio – The piano’s Advanced Wave Memory is an audio sampling system used to replicate the sound of an actual piano through digital capture. The recorded samples are then run through an audio filter. Graded Hammer Keyboard – On the YDP-181’s keyboard the lower tones have a heavier feel while the higher notes feature a softer one. This enhances the digital instruments realism while also building technique. Damper Pedals – The YDP-181 features three damper pedals with half-damper functioning. The lower the pedals are pressed the longer notes are sustained. Polyphony – While some of the best digital pianos in the under $2000 dollar price range will have a higher polyphony of 256 notes, the 128 notes on this instrument is still a good result. USB to Host – The YDP-181 lacks a USB to host feature, requiring the addition of a MIDI to USB line to connect the device to a computer. Bench – The playing bench has been reported by some users as small and narrow, so it may need to be substituted for some players, especially those that play alongside an instructor. Pedals – The damper pedals have been mentioned to be on the tougher side, requiring more force to press them down. The Yamaha Arius YDP-181 is a good versatile digital piano that is helpful for beginners but also impressive enough for experts. Its audio sampling creates a superb sound that is akin to the actual instrument and the touch sensitivity and weighted keys make the experience all the more realistic. The damper pedals and half-pedal effect heighten the player’s versatility and ability to improve skill. 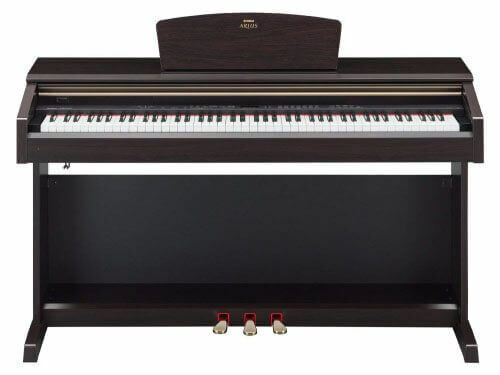 The Yamaha YDP-181 is a useful digital version of the standard acoustic piano.